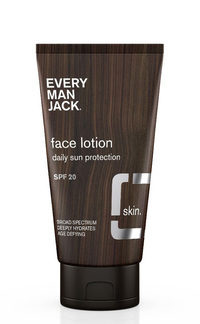 Face Lotion -SPF 20, 2.5 fl oz (Every Man Jack) - Penn Herb Co. Ltd. This light, non-greasy formula is ideal for dry or irritated skin. Chamomile and Cucumber extract soothe, organic Aloe hydrates, while Vitamins C and E protect. Keep yourself safe from the sun’s damaging rays with broad spectrum UVA/UVB SPF 20 protection. Fragrance-free for sensitive skin. ACTIVE INGREDIENTS: Homosalate - 15.0%, Avobenzone - 3.0%, Octisalate - 5.0% (Purpose: Sunscreen). INACTIVE INGREDIENTS: Aqua, Glycerin, Glyceryl Stearate, Sorbitan Sesquioleate, Cetyl Alcohol, Stearyl Alcohol, C12-15 Alkyl Benzoate, Aloe Barbadensis Leaf Juice*, Stearic Acid, Sunflower Seed Oil*, Cocoa Butter*, Lavandula Angustifolia (Lavender) Flower Extract, Chamomile Recutita (Matricaria) Flower Extract, Camellia Sinensis (White Tea) Extract, Arnica Montana Flower Extract, Usnea Barbata (Lichen) Extract, Cucumis Sativus (Cucumber) Extract, Carbomer, Panthenol, Allantoin, Magnesium Ascorbyl Phosphate, Tocopherol, Phenoxyethanol, Ethylhexylglycerin. *Certified Organic. Cruelty Free. Made with many naturally derived ingredients No Parabens. No Phthalates. No Dyes. No Sodium Lauryl Sulfate. No Animal Testing. Vegan. Helps prevent sunburn; for skin the sun burns easily. Use on clean face, neck, and head for everyday protection. And always after shaving. Reapply after working out.